This is a shock to people and impacts both physics and art. Joanne Chu, a Taiwanese soul raised in Kaohsiung, is a nature-born painter and is currently doing research at the Academia Sinica. "According to my conflicting behaviour, I paint with bright and plentiful colours, using strong lines like two artists I admire; Frida Kahlo and Vincent van Gogh, whose life struggles were punched on their canvases to become powerful beauties. 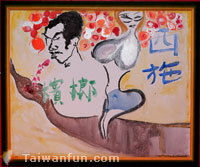 A sense of the fabulous in this world also brings my brush to figure out how the magic features. 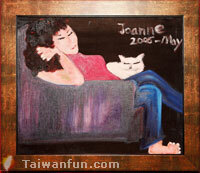 Moreover, you can always see a cat as company in my works." 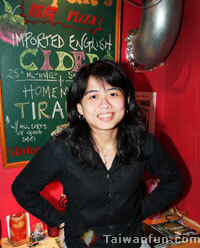 --Joanne Chu. This lady keeps her faith in living as a scientist of art.